When asked what their most important deciding factors were, people who rent Pittsburgh self storage units commonly cite proximity to their home or business and the rental price of the unit. What should be right up there with those two factors is whether the unit is climate controlled or not. If you are willing to pay to store your belongings, then they are valuable to you by definition. You need to be sure they are not only protected from theft, but protected from all the problems that can come with an improper storage climate. The challenge for you the client is that “climate control” is not a well-defined term. What one Pittsburgh storage company might call “climate controlled” (and charge extra for!) might not be any better than what another Pittsburgh storage company offers with their standard priced units. To really understand climate control, you need to break it down into its component parts – temperature & humidity. Variations in temperature can either bake or freeze your belongings. Metals, wood, and plastics have a tendency to warp or crack under temperature stress. 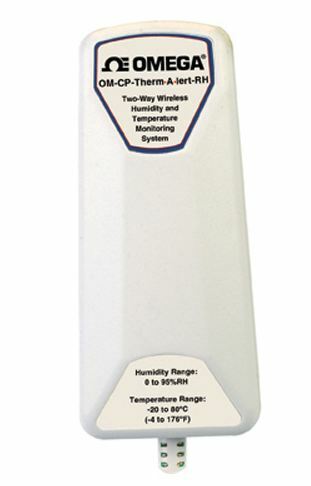 Even if the temperature is perfect, humidity extremes can cause great damage by themselves. Excess moisture can promote mold and mildew growth, cause wood to rot, and aid in the yellowing of documents and linens. Too little moisture can cause wood and other materials to dry out and split. What you are storing will determine your acceptable temperature and humidity range. Let’s look at three of the most common items placed in self-storage lockers – electronics, paper records, and furniture. You can extrapolate from these to determine requirements for other common items like general household goods. 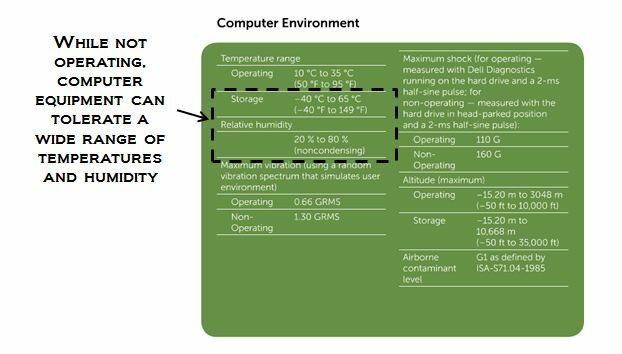 Most people immediately think electronics need to be stored in a highly climate controlled environment, but most electronics are tolerant of a wide range of temperatures and humidity. You can check by looking under “environmental conditions” in the owner’s manual for your equipment. Copied below is that section for some of the computers we use in City Center Self Storage’s office. 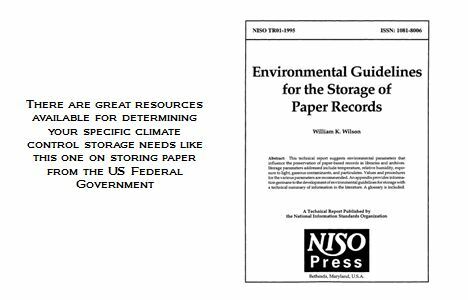 The definitive word for ideal storage conditions for the most sensitive paper records comes from the National Information Standards Organization’s report titled, “Environmental Guidelines for the Storage of Paper Records.” The report suggests that the ideal environment for storing historical artifacts of high value for indefinite periods of time should have constant temperatures less than 70 degrees Fahrenheit and relative humidity levels below 40%. Business paper records and other files can do well in storage that avoids high temperature and high humidity. Papers used in the normal course of business that only need to be stored for a typical seven years will do well in environments with temperatures below 80-90 degrees Fahrenheit and relative humidity levels below 55%. Higher humidity levels can promote mold and mildew growth. Care should be taken before storing furniture made with wood, whether the wood is visible as in chairs and tables or hidden as in a mattress foundation or couch frame. The Smithsonian Institute produces a series of recordings on proper storage for furniture. They also have a downloadable guide with suggestions on environmental considerations for storing furniture. According to the Smithsonian’s guide, the biggest threat to furniture in storage is high humidity. Cooler temperatures are generally better primarily because cooler air carries less moisture at all humidity levels. As long as the relative humidity in a storage environment stays below 55%, wood should be well protected. Large swings in humidity levels are also a major threat as wood absorbs and gives off moisture as relative humidity rises and falls. In doing so wood swells and shrinks which can lead to warping and cracking. Changes in humidity can also cause coatings such as paint to fracture and separate from the surface, creating openings for more damage. It’s best to maintain a constant humidity level within about 10% up or down. Even if the items you place in storage are not particularly climate sensitive, you still want to avoid high heat and high humidity. Combined with the lack of light in storage lockers, they create an ideal environment for molds and mildew. Once those take hold, they create a big cleaning problem and can be hard to eliminate. Basements storage units in particular can have high levels of humidity and should be avoided unless there is a de-humidifier system in place. Most Pittsburgh storage clients with typical items for storage will meet their “climate control” needs with a facility that can demonstrate temperatures range between 60 and 85 degrees Fahrenheit and relative humidity levels that stay between 30% and 60%. Some items are particularly sensitive to changes in temperature and humidity and warrant special care. These include wooden musical instruments, pharmaceutical supplies, furs, and antique paintings. Take the requirements for items like these to a self-storage operator and see if they can prove they can meet your specific needs. Reviewing past data logs and understanding their problem alert systems for temperature and humidity changes should give you comfort. You can help prevent problems by not bringing anything inherently damp into your storage unit or anything with liquids that could leak. Mold can grow and take hold in the time it takes for the items to dry out. Be sure also not to enclose upholstered furniture in tightly sealed plastic bags or wrap, especially when you put them in storage in the spring and summer when high temperatures allow air to carry more moisture than usual. Moisture trapped in the wrapping can condense and become liquid in the cooler temperatures inside the storage facility. You can also protect wooden furniture from drying out by applying a quality furniture polish before you put them in storage. Our advice to you, the Pittsburgh self storage customer, is not to take anyone’s word that they are providing you with “climate controlled” storage. Instead, ask to see the temperature and humidity logs for the specific space where your locker is located. At City Center Self Storage, our building benefits from natural climate control, thanks to the architects and builders who created it for storage, but had no modern control methods available. Our convenient first floor units tend to be a little cooler than our upper floor units which get the benefit of steam heat rising from the middle floor tenants in the winter. We have supplemental heaters for the first floor units that can be turned on as needed in the winter. New thermal windows on the upper floor units keep them tightly sealed avoiding humidity problems. Even though our building is ideally designed for storage, we have installed wireless temperature and humidity monitors throughout our storage space that send back temperature and humidity data every hour all day and night. We even have them set to e-mail and send text messages automatically should a value ever go out of range so we can determine the problem and address it quickly. We’re excited to get these units in place inside our Pittsburgh storage bays. It adds a modern touch to the historic character of the building and will prove in detail what architects and builders were able to accomplish in terms of climate control over 100 years ago without the benefit of modern materials and HVAC systems. We’re happy to show you the logs so you can see the temperature and humidity range in your space and decide for yourself if it fits your storage needs.